In water, ammonia (NH3) exists in equilibrium with dissolved ammonium ions (NH4+). 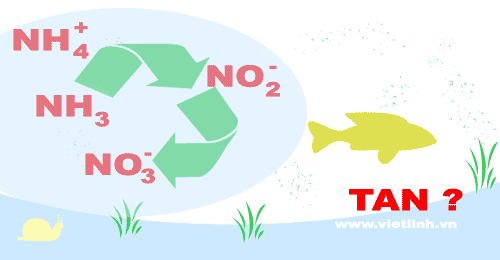 TAN (total ammonia nitrogen) is the total amount of nitrogen in the forms of NH3 and NH4+ in water. In aquaculture, TAN concentration must be less than 0.5 mg/L. The heterotrophic bacteria assimilate TAN into microbial protein. This process should have both nitrogen and carbon sources. According to some references noted by Viet Linh, the ratio C:N> 15 is a good rate for heterotrophic bacteria to consume TAN, and keep TAN concentration in water at low levels. In aquaculture model using biofloc technology, biofloc particles include bacteria sticking with other organisms and organic particles. Biofloc particles that range from 0.1 millimeters to several millimeters are the source of feed supplying protein for fish and shrimp. In this transformation process, TAN is transformed into nitrite (NO2-, toxic) in the first step. After that, nitrite (NO2-) is converted into nitrate (NO3-). These two steps all require the participation of bacteria and oxygen. To reduce ammonia (NH3) and nitrite (NO2-), Viet Linh suggests that the fastest method is to change water. When water cannot be changed, it is necessary to supplement organic carbon to farming ponds. Organic carbon helps heterotrophic bacteria "digest" ammonia. Sugar and molasses are sources of organic carbon for water in ponds. Also, ensure sufficient oxygen to support activities of anaerobic bacteria, stabilize the pH, and balance the density of algae-bacteria ratio.